I meant to post something before we left the valley last Friday, but it kind of got away from me with all the packing and getting ready and all. So here we are in Seattle with the cats and lots of time on our hands between social activities – but also with very limited internet access, so blogging is a bit problematic. Last Saturday we attended a big dinner party with 6 other couples (sometimes there are more) – a longstanding tradition with a group of friends that goes back decades. Nowadays we call it the “Little Dickens Dinner”. Our friends who recently built a house at Suncadia over near Roslyn (east side of Snoqualmie Pass) were the hosts this year, and we all stayed overnight in Roslyn so we could, ahem, enjoy ourselves and remain safe from driving back over the pass. Sunday I got together with some of my knitting buddies and we had a fine time knitting, chatting and snacking on holiday goodies. Monday we celebrated Rick’s mom’s 91st birthday here at our place, with a home-cooked meal by yours truly. Dinner with our friends from Redlands on Tuesday, also here. Dinner with 2 other couples last night, also here! Starting tonight we dine elsewhere, with Christmas Eve dinner and Christmas Day dinner at Rick’s sister’s, Saturday up in Anacortes with my mom and dad and also my brother and his wife. Sunday we go over to Bainbridge Island for birthday dinner with our friends from Redlands and I believe a cribbage tournament may also be in the offing. I hope I can still fit into my jeans by the time we head home next Monday! 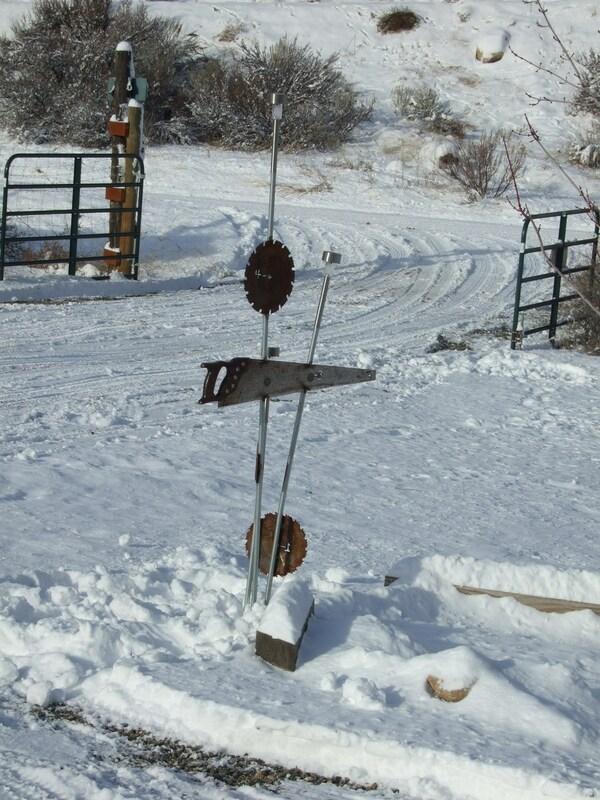 I leave you with a picture of our Christmas present to ourselves: a “Woodworker’s Snow Gauge” by Okanogan metalworking artist Dan Brown. Each saw blade has a 1-foot marker on it, going up to 4 feet. (At the time the picture was taken last week, we only had about 3 inches of snow and from what I hear things have not improved greatly while we have been gone.) The 3 rods have LED lights and solar cells, and when it gets dark they glow. Love the snow meter. Merry Christmas to you both! Have a totally terrific holiday! Very cool snow gauge. Where did you get it? I got it at Confluence Gallery in Twisp, WA. You can find them on the web easily – sorry I don’t have the phone number at hand. There was another one with fish instead of the saw blades, and they are very reasonably priced. The artist is Dan Brown. I am sure he would make another one like it.